LIMICAR is one of the largest manufacturer in the automotive parts aftermarket. LIMICAR is engineered from high-quality materials for years of service. Easy to install. High quality tested to ensure long-lasting performance. LIMICAR is featured with advanced technology to meet OE specifications to offer a full range of auto products to cover a variety of applications and repair needs. 1. Slim Line Utility LED Strip Light Bar are suit for lighting or decorating interior and exterior of boats, RVs and any other 12V Vehicles. 2. High light efficiency and durable, long lasting, low power consumption and energy saving. 3. Easy Install to different types vehicles. 4. Waterproof, Dustproof, Anti-shock & Anti-vibration. 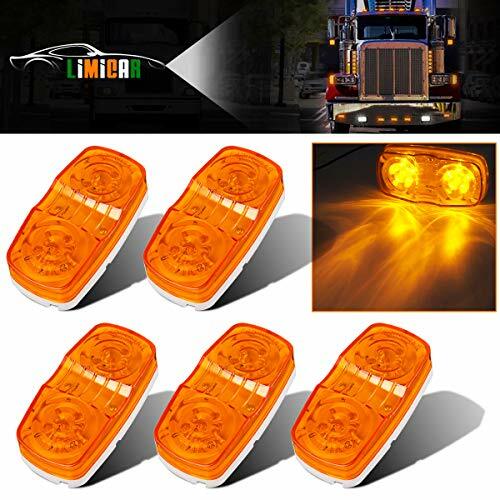 Light Size: 3.9" x 1.9" x 1.1"
Compatible For: Side Marker Lights, Roof Lights, Turn Signal Lights, Clearance Lamp, Cab Lights, Indetification Lamp Roof Lights, Corner Rear/Front/Side Lights, Heavy Trucks Like Peterbilt, Freightliner, Kenworth, RV, Trailers, Campers Pickups Truck Trailers SUV Camper Van Caravan and Boat Lorry Bus etc. Brightness: 10 Diodes High Quality, Long Lifespan, Ultra Bright. Suit For: Ideal for cab and sleeper panels. Fits Standard 3" mounting Holes. Product Size: Light Size: 3.9" x 1.9" x 1.1"; Hole Distance: 2.9". Installation: 2 Wires Connection. Black is the Negative and Amber is the Positive. Package Included: 5 x Amber Marker LED Light. Quality: 1 Year Warranty. View More In Trailer Lights. If you have any questions about this product by LIMICAR, contact us by completing and submitting the form below. If you are looking for a specif part number, please include it with your message. © 2019 - zvejotribuna.net. All Rights Reserved.